Today we got 4 of the new diapers I ordered. I also spent the whole day using cloth on L. All the new ones are in the wash, along with the ones she dirtied today, which means it will be a night of disposables, but I'm really glad we're getting closer and closer to completing the switch. I'm sure many of you know what "modern" cloth diapers look like, but since a lot of you don't I thought I'd show off what we have. 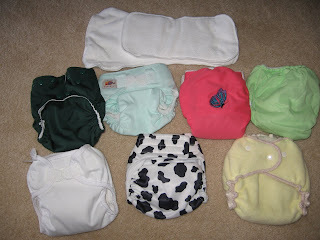 The cowhide diaper and the four on top are all diaper that use inserts. 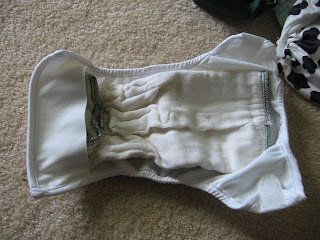 The diaper itself is waterproof and has a cloth lining, but the inserts (at the very top) are snapped or stuffed in for more absorbency. The one on the bottom left is today's version of a rubber pant, a diaper cover. A cloth diaper like the one on the bottom right or an old fashioned prefold (what we wore when we were little and what our mother's now dust with) goes in the cover. What's nice is that the prefold doesn't necessarily need to be pinned, as you can see below. Just fold it and stuff it in the little flap. 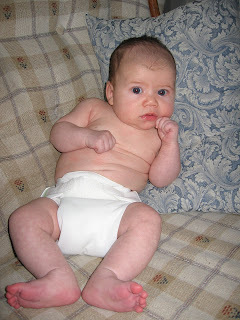 This is L modeling one of the All-in-Ones, meaning there's no need for a diaper cover or inserts. 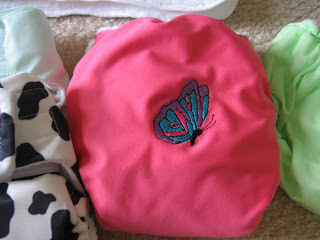 The pink diaper with the embroidered butterfly was a gift from a woman at church. Her daughter lives in town and makes the diapers. I LOVE it! The other diaper covers that I ordered should come in later this week. Once we get those we should be able to cloth diaper throughout the day, although I'll probably have to use disposables at night while I wash everything for the next day. I'm still learning, though, so we'll see! So fun! Was that a haute pocket I saw in your stash? Love those! We used disposables at night until we had enough to last all day, too. Since Aiden sleeps through the night, we end up stuffing her dipe with three liners. She has a major booty at night, it's cute!